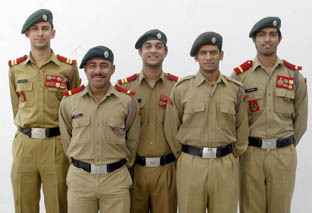 21 Dec ,MOHALI : In the backdrop of the Army facing a severe shortage of officers and very poor rate of induction of NCC cadets in the armed forces, it is a proud moment for Gian Jyoti Institute of Management and Technology, Mohali when it’s six NCC Cadets selected for final interview of Short Service Commission at Bhopal(M.P). NCC cadets are preferred for recruitment to the armed forces. They have a distinct advantage over the general candidates, but for that distinctive edge, an NCC cadet should be a certificate-holder. There are three types of certificates that a cadet can secure, namely ‘A’, ‘B’ and ‘C’. The most coveted is the ‘C’ certificate. Total 25 students were shortlisted for the group Discussion from four districts Patiala, Sangroor,Fatehgarh Sahib and Mohali . Only 14 students are selected for the final interview at Bhopal(M.P) and 6 students out of all 14 students are from Gian Jyoti Institute of Management, who are selected this final process. Mr.J.S.Bedi,Chairman,Gian Jyoti group said that ,” Indian Army has long enjoyed the reputation of being one of the finest forces in the world. A career in the armed forces, therefore, holds the promise of bringing honour, glory, high social standing, and a privileged lifestyle. “The defense establishment is now also competing with other more lucrative career options available to the country’s young people and GJ-IMT always encourage the students to join army for serve the nation,” he further added. ‘‘The selection was very difficult as nearly 450 students were contesting for their selection for short service commission. I was one of the lucky 24 cadets who were screened for the final interview at Bhopal. Finally, at Patiala camp I was informed by the Directorate that I was selected for the interview and my excitement knew no limits,’’ Cadet Akashdeep said.